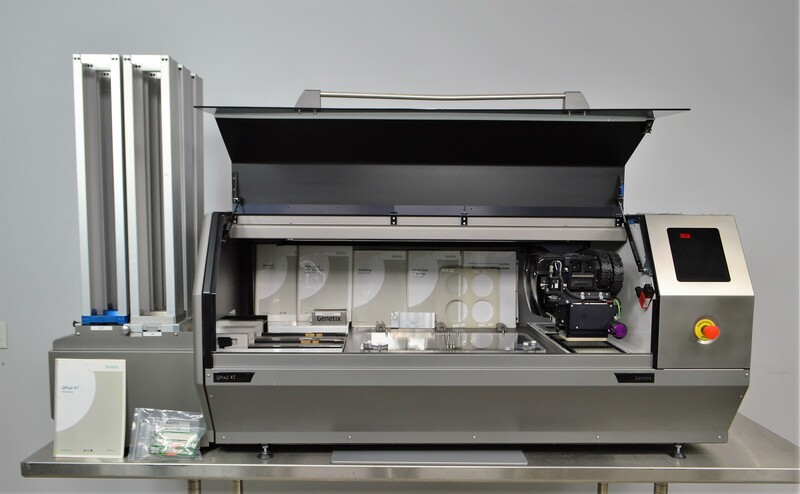 Molecular Devices Genetix Qpix 2 XT Automated Arraying Bacterial Colony Picker . New Life Scientific, Inc. The QPix-XT 2 was powered on in the technician's shop, but the internal drives did not complete booting. The Allen-Bradley Ultra 3000 drives status indicators displayed 'L' on the digital readout, but the third continued to actively cycle. The technicians were unable to troubleshoot this error and recommended that the QPix is sold for parts. A qualified technician or Allen-Bradley representative will need to resolve the digital servo drive error. The 'Flashing L' indicates that the "drive is in an overtravel condition and motion restrictions are in effect." (Allen-Bradley Ultra3000 Digital Servo Drives, Publication 2098-IN005C-EN-P--March 2008: p.98). This instrument is in excellent cosmetic condition and includes a number of extras. The technicians were unable to resolve troubleshooting with the digital servo drive and NLS will sell this product for parts / in need of repairs. The technicians do not have the time or resources to reprogram the erroneous servo drive(s).